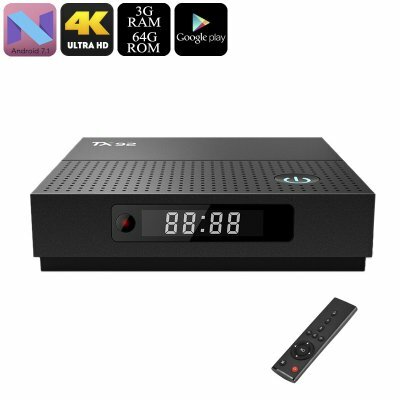 Successfully Added TX92 Android TV Box - Octa-Core CPU, 3GB RAM, 4K Support, Bluetooth, WiFi, Google Play, Android 7.1, DLNA (64GB) to your Shopping Cart. The TX92 Android TV Box is the perfect gizmo for those of you who are looking for an Android Media Player that packs a punch. With its Octa-Core processor and 3GB RAM, this Android TV Box is capable of tackling the latest and most demanding software features out there. Whether you wish to simply use it to watch films, browse the web, enjoy TV apps, or play games – this TV box is sure to meet your demands. Along with its Android 7.1 operating system, it is guaranteed to treat you to a smooth user experience at any time. By supporting 4K resolutions, this 4K TV box lets you enjoy your favorite films and series in Ultra-HD resolution. From now on, you’ll be able to undergo a cinematic experience from the comfort of your own living room. You will be treated to 64GB ROM as well as 64GB external memory support. With all this storage at hand, you won’t have to worry about running out of space to store your films and games anytime soon. Google Play and TV Center access let you easily download the latest Apps and software. With this 4K TV box at your side, you’ll never have to feel bored again. The TX92 Android TV Box supports DLNA for easy file sharing. Additionally, it also lets you use your gizmo with other electronic gadgets such as a wireless keyboard or gamepad thanks to its Bluetooth support. Miracast and Airplay will further increase your usability by letting you mirror all that’s happening on your iOS or Android phone onto your big screen TV. With its WiFi support, this Android TV box even lets you browse the web in order to download files, stream movies, or to stay in contact with friends and family online.